Iron Deficiency in Infants and Toddlers and Possible Consequences. – Of all nutrient deficiencies, iron deficiency is the most common and is especially prevalent in infants and toddlers. – Iron deficiency and iron deficiency anemia in infants may adversely affect long-term neurodevelopment and behavior; some of these effects may be irreversible. – Studies confirm that iron deficiency anemia increases lead absorption; therefore, prevention of iron deficiency anemia might also serve as to reduce the likelihood of lead poisoning. – Infants between 6 and 12 months have an RDA for iron of 11 mg/day. –Breastfed term infants at 4 months of age need 1 mg/kg per day of oral iron as a liquid supplement until appropriate iron-containing foods are introduced into the diet. – Partially breastfed term infants receive more than half of their feedings as human milk and do not receive supplementary iron-containing food. At 4 months of age, these infants need 1 mg/kg per day of oral iron as a liquid supplement until iron containing foods are introduced. – Formula-fed term infants do not typically need iron supplementation for the first 12 months because of the iron content of most infant formulas. 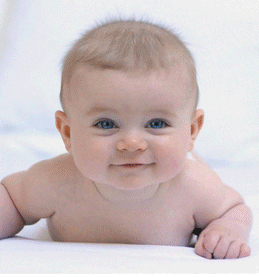 – Preterm infants (in a full term newborn infant is accumulated during the 3rd trimester of pregnancy. As a result, premature infants miss this rapid iron accumulation. Estimation of the iron requirement for preterm infants can only be approximate (i.e., 2-4 mg/kg per day). – Breastfed preterm infants should receive a supplement of elemental iron of 2 mg/kg per day from 1 month of age through 12 months of age or until the infant is either weaned to a formula which is iron-fortified or begins eating foods that provide 2 mg/kg per day of iron. – Formula-fed preterm infants typically receive about 2 mg/kg per day of iron from a standard infant formula and most will typically not need iron supplementation. However 14% of preterm formula-fed infants between 4 and 8 months of age will require iron supplementation; the amount needed varies between infants. RDAs for Toddlers and Children. – Toddlers 1 to 3 years of age have a RDA for iron of 7 mg/day as a liquid supplement. 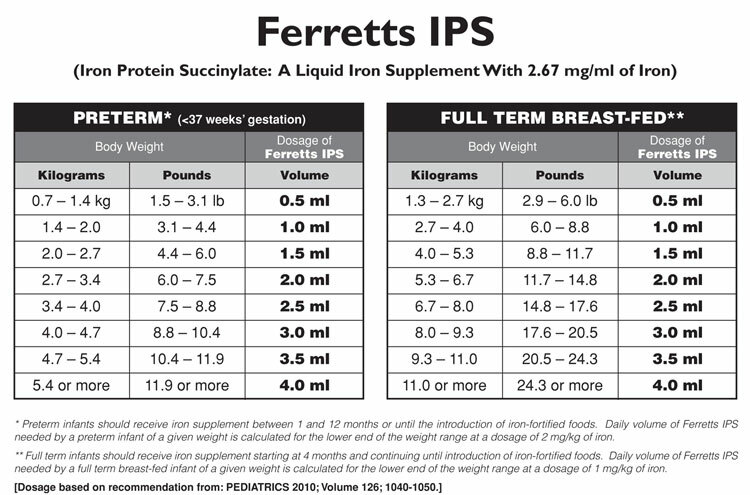 *If Ferretts IPS, our liquid iron supplement is used, then 2.50 ml per day would provide sufficient iron*. Check with your physician before taking an iron supplement or giving an iron supplement to a child. *WARNING: Accidental overdose of iron containing products is a leading cause of fatal poisoning in children under 6. Keep iron containing products out of the reach of children. In case of accidental overdose, call a doctor or poison control center immediately.